Beth Breeze is Director of the Centre for Philanthropy, which she co-founded in 2008. Beth began her career as a fundraiser for a youth homelessness charity, and spent a decade working in a variety of fundraising, research and charity management roles, including as deputy director at the Institute for Philanthropy in London. Motivated by the lack of substantive research underpinning practice, Beth completed a PhD on contemporary philanthropy at Kent in 2011, and has been working here ever since. 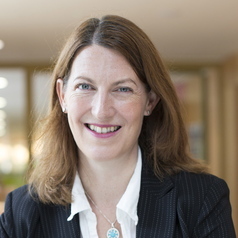 Beth has written and edited four books: Richer Lives: Why Rich People Give (2013, co-authored with Theresa Lloyd), The Logic of Charity: Great Expectations in Hard Times (2015, co-authored with John Mohan) and The Reader on Philanthropy (2016, co-edited with Michael Moody). Her latest book, The New Fundraisers: who organises charitable giving in contemporary society? (2017), won the AFP Skystone Research Partners book prize. Having launched the first Masters degree in Philanthropic Studies outside North America in 2016, which is taught by distance learning to meet the needs of busy professionals, Beth is now Director of Studies of that programme. Beth has served as trustee for the Cardinal Hume Centre for young homeless people, as a Commissioner on the Commission for the Donor Experience, as publications editor of Philanthropy UK, as a member of the President's advisory council at NCVO; and am currently a member of the Advisory Group of the Charity Tax Commission.